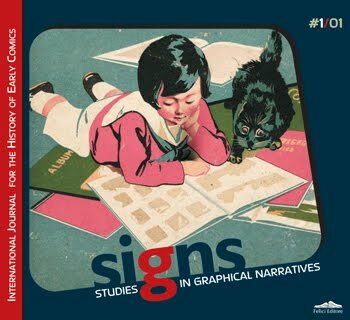 SIGNs – Studies in Graphic Narratives – is a new, peer-reviewed journal focusing on Comics (or, in contemporary jargon, Graphic Novels), from modern times up to the early decades of the 20th century. Why a new journal ? We have been living a steeply growing interest in comics since the 1990s, with the medium gaining large acceptance as an art form and a significant part of popular culture as well as an investigation subject in social studies. This interest and intellectual appraisal has extended to the rich history of comics and related forms as well. However, hitherto the (still scarce) current scientific research tends to focus on post-1930s publications, and early comics remain largely unexplored. SIGNs aims at bridging this gap. Notwithstanding impressive field work by pioneers like David Kunzle in his two volumes of The History of the Comic Strip, the medium still suffers from a somewhat meager historiographic ‘legacy’. Yet, a basis of shared facts so far remains to be devised, so SIGNs has the ambition to become a regular forum for establishing a common historical knowledge on comics, dismissing surviving myths and putting modernity under the limelight. SIGNs strives for the multi-disciplinary approach which is common today in other fields, encompassing economy, linguistics, cultural studies, aesthetics, publishing history and art theory, thus offering new pieces for the completion of the dispersed sort of puzzle that constitutes comics history. SIGNs has the ambition to push forward the historiography on the medium by bringing together the best researchers and publishing articles on Graphic Narratives – let them be called comics, graphic novels or sequential art – printed worldwide in a period roughly encompassing the 1830s and the 1930s. Each issue will also contain high-quality reprints of rare material, reproductions and translations of hard to find texts, and, in forthcoming issues, a review section surveying publications of relevance. Even if our ambition is scientific, text readability and attractive, profusely illustrated, layouts are of great importance as well. We hope that the reader will find it a pleasure to glance over the pages, to become charmed by the drawings or to be caught up in a solid discussion. Something is changing in the world of comics today. And in the current transitional climate – where digital media are restructuring our cultural scape – the self-consciousness of contemporary comics culture is linked to a reworking of comics history and memory. If retracing its past may contribute to redefining its nature, then historical studies are definitively a direction worth taking. Possible Readings of a Comedy Type. Relating Comics to Premodern Art. A Florentine Series of Prints from 1796. Request info about subscriptions and forthcoming issues. We solicit contributions. Send us an up-to 2000 words abstract. Order an issue via the publisher.